Joe Danger was Hello Games first title and it was released on the PlayStation Network last year. Since then the game just blew up, getting high scores from the likes of IGN, Game Informer and Eurogamer and pretty much gaining recognition worldwide! Well they’re back again with the announcement of Joe Danger: The Movie and I got the chance to play and talk about the game with the ever happy, Sean Murray from Hello Games who was cool enough to walk me through it and answer a few questions. You can see the walkthrough video below! 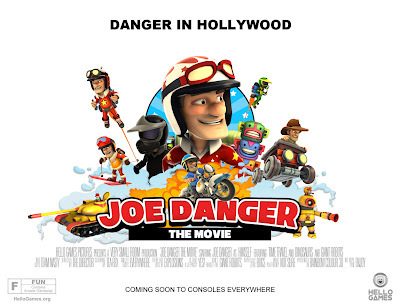 So Joe Danger is back again and he’s starring in his own movie. The movie set levels where obviously inspired by well… movies and I’m not talking about The Matrix or Spiderman of this time but a little more old school like Robocop and The Rocketeer, the type that the current generation would have no idea about. I remember recalling Joe Danger in a slime kind of level which reminded me of Ghost Busters and the Mine Cart level, looking like something out of Indiana Jones. It was easy to see where the ideas where coming from but it was more impressive to see how they were able to implement it into the game’s universe and have it work side by side with what was already available. A new feature would have to be the addition of more than one vehicle in the game. In the Original Joe Danger, you were only on a motorbike but now you’ll be flying around in a Jetpack, sliding through snow in with a Ski or speeding through a Mine in a Mine Cart. It was good to see that the team was expanding on the idea of speed in general to challenge the player. Now I don’t mean Joe going at ridiculous speeds constantly but gradually shifting it between levels so the player doesn’t get too accustomed with the gameplay. As for the controls, it does pretty much feel the same and the setup worked nicely before so why fix something that isn’t broken. Of course as they introduce new gameplay elements, they could require an extra button or so but we’ll just leave that to any announcements that could happen down the line. The version I played was still really early in development so what platform the game will be coming out on and such details could greatly change over time. The only thing I can say is to keep an eye on the Hello Games website – http://www.hellogames.org/ for more updates.